EXROE-5 was the android guardian that Johnny Redbeard had stationed at the facility where the Possessor was locked away in his isolation booth. When She-Dragon infiltrated the building, EXROE-5 was activated and attempted to eliminate her. It was deactivated through a massive electrical overload, leaving it helpless for the authorities. Some time after regaining its freedom, EXROE-5 was recruited by OverLord II to join his faction of the Vicious Circle. It was one of those villains set to execute the Dragon should he break free from a death trap set up by his arch-enemy. Both the trap and the assembled freaks proved incapable of killing the hero. Years later, Dragon recruited renegade members of the Vicious Circle to help him overthrow CyberFace from his seat of global power. 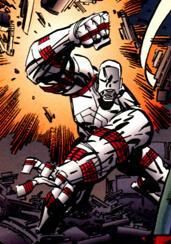 EXROE-5 was targeted at his original post and destroyed so that the Possessor could be unleashed against CyberFace. Dragon ordered that no piece of EXROE-5 bigger than a grain of sand should be left intact before scattering the remains.